In 1928, Alexander Fleming’s bacterial cultures were contaminated by airborne spores of a green mould. Fleming noticed that bacteria were not growing close to the green mould. He concluded that the mould was producing a compound that was killing or inhibiting the growth of bacteria. That is how Penicillins, the oldest and probably the best known of all the antibiotics were accidentally discovered. The green mould was later identified as Penicillium notatum. Penicillium notatum (now called Penicillium chrysogenum) is one of the most common indoor fungal contaminants. Penicillium is found worldwide. The spores of this mould are found everywhere in the air and soil. 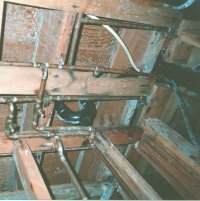 In indoor environment, this mould proliferates in damp conditions. Penicillium is commonly called the blue or green mould because (depending on the species) it produces enormous quantities of greenish, bluish or yellowish spores which give it the characteristic colour. The blue in the blue-cheese, for example, is the colour of the spores of the Penicillium species used in ripening the cheese. About 200 species have been described. In indoor environments, Penicillium is extremely common on damp building materials, walls and wallpaper, floor, carpet mattress and upholstered furniture dust. The spores of this mould are produced in dry chains and are exposed to the air hence their ease to become airborne. Spore sizes range from 3 to 5 micrometres. Because of their small size, they take long to settle and can be inhaled deep into the lungs. The spores are found indoors throughout the year. For air samples analysed by direct microscopy, it is hard to distinguish between spores of Penicillium from those of Aspergillus. Therefore these spores are often reported as Aspergillus/Penicillium. 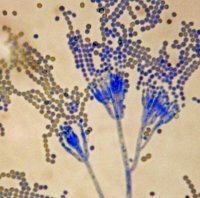 The most common Penicillium species in indoor environment is Penicillium chrysogenum. It produces a number of toxins of moderate toxicity. It is also allergenic and can infect immuno-compromised patients. Many species of Penicillium are common contaminants on various organic materials and are recognized potential mycotoxin producers. The most well known toxin producing species in foods include P. citreonigrum, P. citrinum, P. crustosum, P. islandicum and P. verrucosum. Therefore, when it comes to food contamination, correct identification of Penicillium is important. Although, human pathogenic species are rare, opportunistic infections have been reported in individuals with weakened immune system such as the HIV/AIDS patients. The species commonly associated with opportunistic infections is P. marneffei. Penicillium species are common causes of spoilage of fruits, cheese, cold meats, old sandwiches, cereals and cereal products and a host of other agricultural and animal products. For example, Penicillium italicum and Penicillium digitatum are common causes of rot of citrus fruits, while Penicillium expansum is known to spoil apples. As mentioned above, most Penicillium species produce toxins. 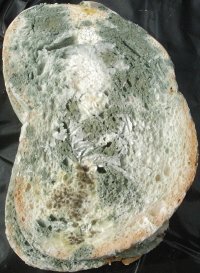 It is a good practice to discard foods with any visible mould growth. It is important to know some species of Penicillium are beneficial to humans. For example, cheeses such as Roquefort, Camembert and others are ripened with species of Penicillium. Introduction to food and airborne fungi. Seventh Edition. Samson, Robert A., Hoekstra, Ellen S., Frisvad, Jens C (Editors). Centraalbureau voor Schimmelcultures, 2004. Microorganisms in home and indoor work environments: Diversity, Health Impacts, Investigation and control. Flanning Brian, Samson, Robert A., and Miller, David J (Ed. ), Tayler and Francis, 2001. For more information on Penicillium species,please visit http://www.moldbacteria.com/learnmore/moldlist.html or call 905-290-101.